Less than 24 hours ago, our friend and fellow Young Global Leader Juan Mario Laserna passed away after a car accident. For those who had the privilege of brefriending him this is a sad moment. I had known Juan Mario for quite a while, but it was only when we both became Young Global Leaders (YGL) that our friendship really developed. Juan Mario truly lived the YGL spirit, actively participating in all summits and activities around the world. More recently, he was very enthusiastic about working as a YGL Alumni to strengthen the community. It was through his actions that his YGL spirit really shined, particularly in his contributions to his native Colombia, and to his home town of Ibague were he strived to make a difference. Juan Mario left Colombia at a young age but always with the goal of coming back to be part of the transformation of the country. He graduated from Yale with a degree in Economics and later went to Stanford to get his MBA. On graduation he didn't go into business as most MBAs do, instead, he returned to work for the country as Economic Advisor to the President -- the youngest member of the so called “President´s Kindergarten”, a group of young and very talented, mostly foreign-educated public servants who worked with President Gaviria (1990-94). He then became Vice Minister of Finance and Director of Foreign Credit, managing Colombia´s indebtedness at a particularly challenging time. This led to his appointment as central bank governor at a very early age. Eventually, he decided to run for public office becoming one of the most respected Senators in the Senate Finance Committee. Most recently, he had dedicated his life to journalism, first at one of Colombia´s most prominent morning radio programs, and also as Editor of “Dinero”, the country´s best known economic and business magazine. Juan Mario had high political ambitions and I have no doubt he would have achieved them. It is a big loss for Colombia as Juan Mario represented exactly the type of leadership we need in our country -- kind and principled yet strong and supported by a deep understanding of the country. Although his life was short, he managed to achieved a lot. We have lost a remarkable human being, a brilliant mind, and someone who made it a priority in life to serve others. 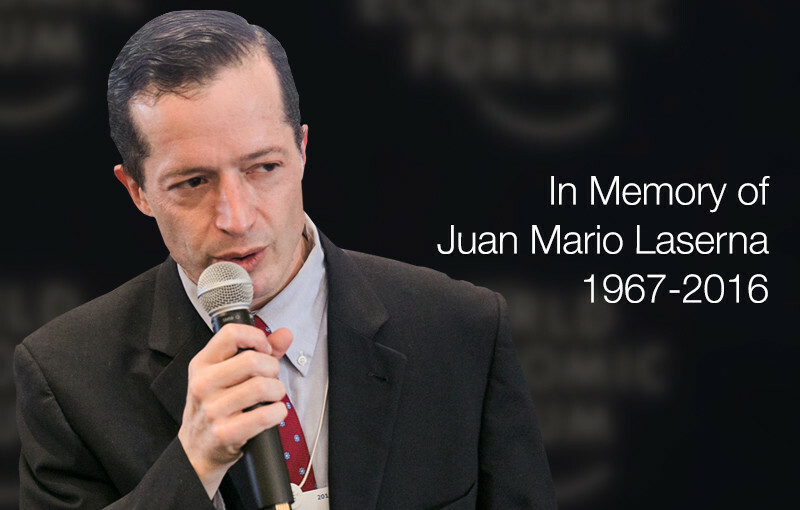 Today we remember the life and achievements of Juan Mario Laserna , Editor of Revista Dinero. From a young age, Juan Mario was involved in policy making serving as an economist who took on substantial leadership roles that drove the economic development of Colombia in a positive direction, first with the Ministry of the Treasury, then the Office of the Presidency, the Inter-American Development Bank, and eventually as a Member of the Board of the Central Bank of Colombia. More recently, Juan Mario upheld the role of Senator in the Colombian Congress from 2010 to 2014, where he was recognized as the top Senator in the country. Since 2014, he was the Editor of Revisa Dinero where his influence through print and radio has been felt across the country. At the Forum, we knew him as a YGL Alumnus from the Class of 2007 and as one of the most lucid and conciliatory public sector leaders – capable of providing economic analysis that would drive the country forward, while bringing together leaders of diverse opinions to implement change. He was clearly from a new generation of Colombian leaders, with an unquenchable thirst for knowledge, networks, and a desire to see a better future. The world has lost a great leader with energy and passion to make a difference – join us in remembering and honouring Juan Mario.